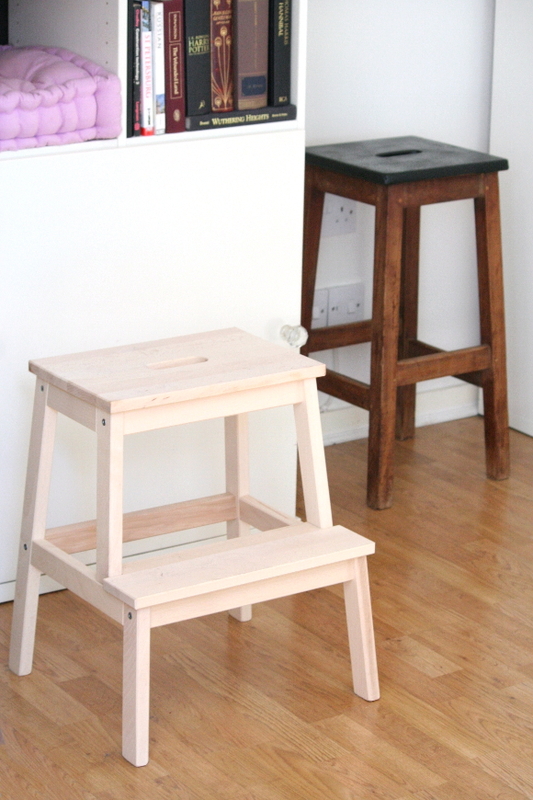 Last week I wrote about my new step stool combo and how I wanted to coordinate my BEKVAM stool with my salvaged skip stool in a way that would fit in with our living room a little better. 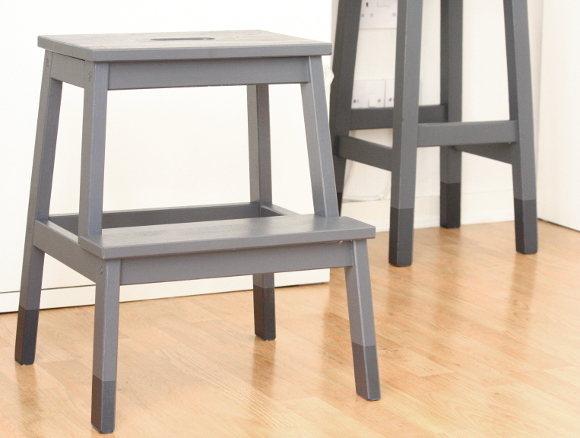 To give you some history, long ago I found this broken bar stool in a skip, cleaned it up and repainted the top black. When I bought our new BEKVAM stool a couple of weeks ago, I saw their potential and was prompted to give them both a little makeover. 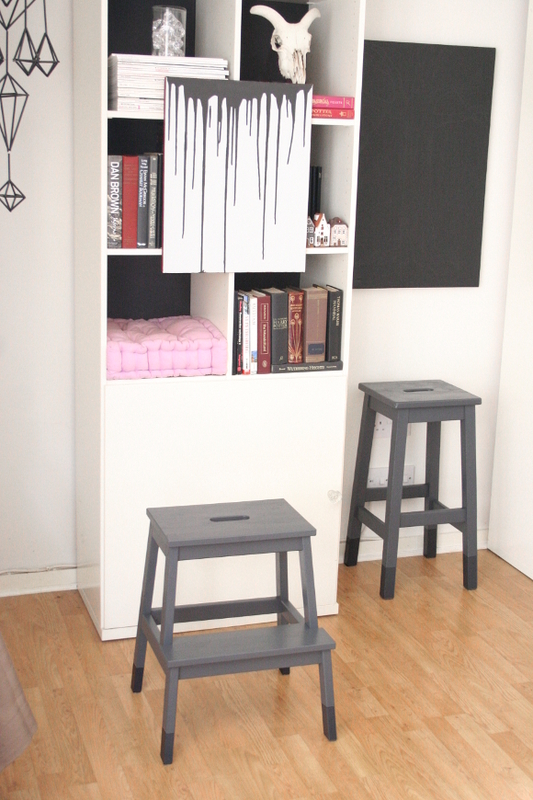 I did a lot of head scratching and googleing of IKEA hacks and I eventually decided to paint them light grey with black dip-dye legs. I like the dip-dye trend that all the cool people are trying out these days so I thought I’d try it for myself. And it looked meh. You can’t really tell from the above picture, but our / our landlords 10-year-old IKEA shelving is what I like to call IKEA ‘white‘. Which in fact is not white. Hence the italics and quotation marks. The shelves are a light shade of cream. So anything that isn’t progressively more yellow than them looks blue. Meaning, the light grey paint on the stools looks blue in front of the yellow, I mean white, shelves. The grey just wasn’t dark enough so while clashing with the shelves, the stools also blended into the background as well. Do you remember those eye puzzle posters that were huge in the 90’s? 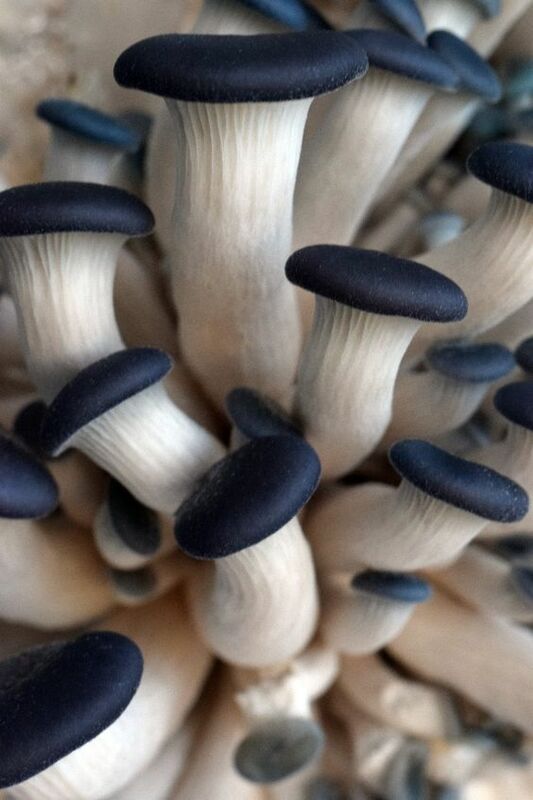 You’d stare at them and then all of a sudden a 3D image would pop out? 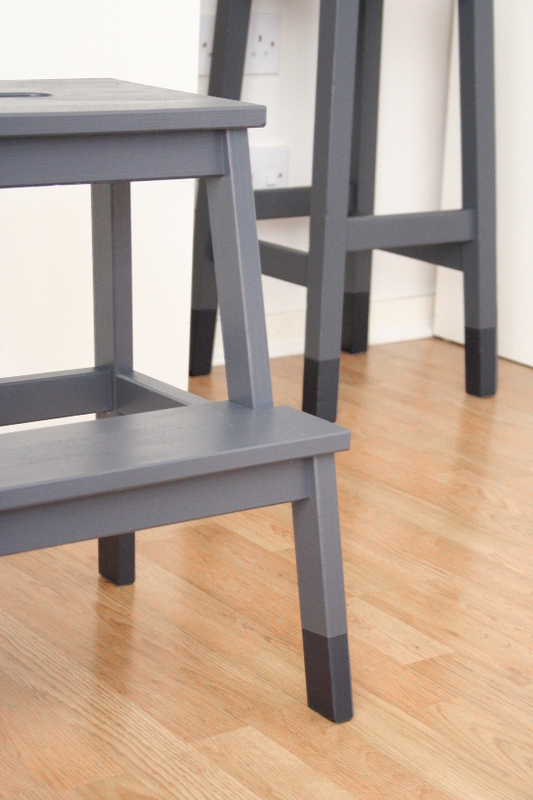 That’s what happened to my stools when they were this colour. You didn’t really see them but once you do, you feel like reality has been altered ever so slightly. Not what I was going for. So back to the drawing board. I knew I wanted to go darker, but I didn’t want to go black. I went to my local hardware store, saw the Dulux Exterior SatinWood paint in ‘iron clad’ [sorry, no direct linkage available], and I couldn’t resist trying it out. Yes, it’s paint meant for front doors and the likes but I’ve got to say, this paint is kind of amazing. Yep. I have a stool for our cats. 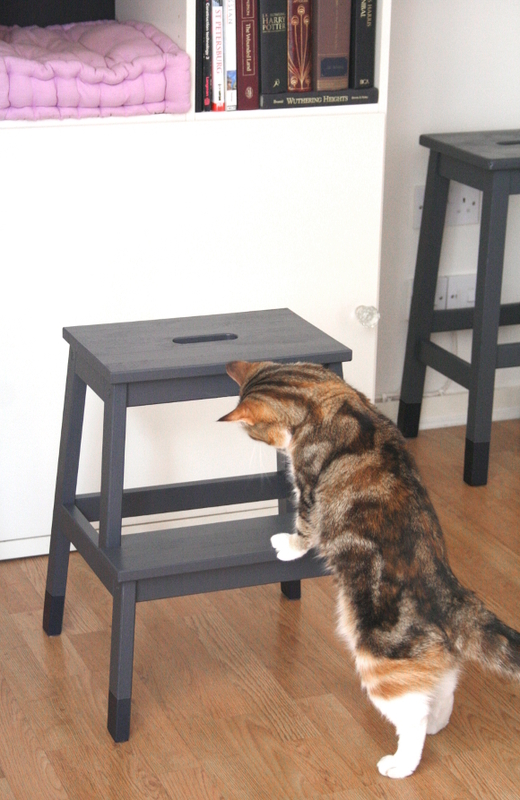 I of course actually use the step stool, but while it’s not being used by humans, our cats get full use of it. p.s. I can’t handle how cute and curious Juniper looks in this picture. It’s like she’s inspecting my painting skills. I’m so glad I used this paint as it dries so fast. I was able to paint two coats on both stools in an hour and that’s including drying time. They have a lovely satin finish and aren’t tacky to the touch like some paint can be. In fact, I was so enthusiastic that I repainted our entire bedroom dresser in it this morning. From start to finish with two coats of paint and dry within an hour. That’s what I’m talkin’ ’bout. Great work, they look fab together! Do you find that dulux paint better than Annie Sloan? I find Annie Sloan Chalk Paint very hit or miss. After about 3 days on our dresser I wanted to repaint it. It's the darker shades that [I think] don't work as well. Very happy with the Dulux version of our dresser now! This post is brilliant – I was laughing most of the way through it, you are such a funny one! I would start quoting all the funny bits from this – but there are too many. Love the concluding sentence too! 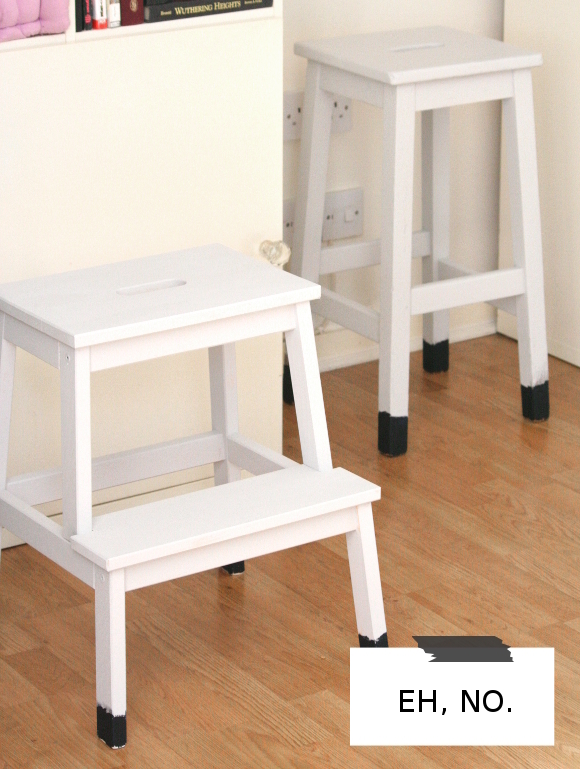 Ok, onto the stools – yes! They look amazing. That dark grey is perfect – much more striking than the light grey. I like the neat black on the legs too, rather than the rougher dip-dyed look from attempt one. It looks more polished and sleek. Having both of these stools matching really works so well. Great that you've managed to turn a skip-find and a cheap Ikea purchase into a quality matching pair. I'm really impressed!